Why is there no blue food? Why is there no (or at least, so little) naturally occurring blue food? Nature seems to have provided us with edible substances of every other hue, but the only blue food to be found in the supermarket is invariably artificially colored. Even blueberries aren't really blue. How come? Why is there no blue food? I can’t find blue food — I can’t find the flavor of blue! I mean, green is lime; yellow is lemon; orange is orange; red is cherry; what’s blue? There’s no blue! “Oh,” they say, “blueberries!” Uh-uh; blue on the vine, purple on the plate. There’s no blue food! Where is the blue food? We want the blue food! Probably bestows immortality! They’re keeping it from us! Some find this funny. I, however, am not amused. The bit works only because Carlin cavalierly dismisses several nominally blue foods, including not just blueberries but, in other performances, blue cheese and bluefish. Cheese and fish I’ll let slide. The notion that blueberries aren’t blue, on the other hand, sticks in my craw. I love blueberries. In one of my few concessions to domesticity, I periodically make blueberry jam. It is, I acknowledge, purple, because the inside of the blueberry is purple. However, the skin of the blueberry is blue, which is the fact of importance. Brightly colored fruits and vegetables generally look that way to attract animals, who carry them off to eat and scatter the seeds. Who cares if blueberries are purple on the plate? When the propagation of the species is on the line, blueberries are blue. You say: fine, but the fact remains that we have few blue foods, in contrast to numerous foods of other common colors. Why? Blue foods are rare because leaves are green. Work with me on this. Broadly speaking, two classes of chemicals produce bright colors in edible plants. Yellow, orange, and red are generated by chemicals known as carotenoids, most famously evident in carrots. Red, purple, and blue are produced by compounds called anthocyanins, found in everything from grapes to eggplant. The common element in these two sets of colors is red. Why red? No doubt because it contrasts so strikingly with green, the default plant color due to the chlorophyll needed for photosynthesis. (Why chlorophyll is green is a question for another day.) In opponent-process color perception, thought to be at work in many primates and presumably in birds, red and green are visual antagonists, incapable of blending — there’s no such color as reddish green. If you’re a plant and you want to produce a fruit or flower sure to stand out against green foliage, red’s your best bet. Naturally, depending on circumstances, you, Joe Plant, may want to dial the red up or down. In the tropics you may find yellow or orange fruit is the best way to increase your bird traffic. If you’re pushing berries in more temperate climates you may have better luck with darker colors, which you can get by amping up on the blue in your anthocyanin paint box. But generally some red remains on the brush, so to speak — and red and blue make purple, a common color for fruit. Now, under some conditions it may be useful for a plant to suppress red to such a degree that its edible bits aren’t just purple or bluish but indisputably blue. Or the local environment may simply favor blueness — high acidity accentuates the red in anthocyanins, while low acidity brings out the blue. Circumstances evidently don’t align often, but when they do the result can be startling. Blueberries not blue enough for you? 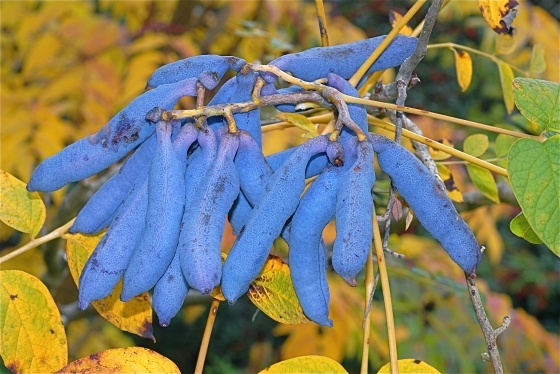 Search online for images of blue quandong or Decaisnea fargesii, both of which bear fruit that’s blue to the point of being unnerving — the fruit of D. fargesii, in fact, is popularly known as dead man’s fingers. For better or worse, the dominance of red in the edible food palette means such sights are rare. It might have been otherwise. Scientists have speculated that, prior to the emergence of chlorophyll as the primary medium for photosynthesis, primitive organisms used a pigment called retinal. Retinal is purple, meaning Earth would have been not a green planet but a purple one. Were that the case now, the dominant color in edible plants arguably would be the visual opposite of purple. Purple is a mix of red and blue, and the opponent color to blue is yellow, so the opposite of purple would be a mix of green and yellow. In other words, the most prevalent food color on a purple world might well be chartreuse. Far-fetched? Hush now — our hypothesis lets us offer hope to George Carlin disciples. All we need to do is find is a planet where the baseline foliage color is yellow. Assuming the local fruit-eaters perceive color the same way Earth’s do, I’ll bet you a jar of dead-man’s-finger jam that the dominant food color would be blue.